Behind the Bit: Curved Browband Bounty: Pay dirt!!!! Curved Browband Bounty: Pay dirt!!!! I love curved browbands but they are shockingly hard to find in the colors/styles I'm looking for. Well, here is the Web site we need, at http://www.os-sattlerei.com/en/stirnbaender/stirnbaender.php. 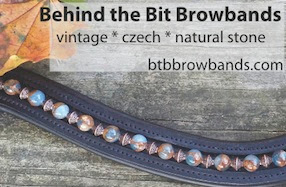 TWENTY-SEVEN PAGES OF CURVED BROWBANDS! Oh My! Otto Schumacher: The Bentley of Bridles. Oh my! Otto Schumacher: The Bentley of Bridlers. Oh no! They have a sapphire and yellow one! I'm DOOMED! Wow! Wiping the drool off my chin. Wow, this has made me so happy! I couldn't find a curved browband for the longest time - I even know someone who ended up making their own cause they couldn't find one. I'm going to have fun with this website... The real question though is how much do they cost? How do you order them tho? Pretty, pretty. Costly, I'd imagine. Do you notice how often expensive items don't come with "up front" price tags? In the jewelry stores, they often turn the tags upside down in the display cases. Soo sooo gorgeous. I love the curved design soo bad but sadly none of theirs have all emerald colored crystals, but perhaps they will do custom? It's just that I'm afraid to call and ask to find out the price. Ooops, I take that back. There is an emerald one on page 17 that I somehow missed. Unfortunately, it is perfect and I am still afraid to find out how much it is. So pretty! They're giving me butterflies. If only I had about $250 to blow. :( I daresay my horsey needs a pretty trinket on his head. 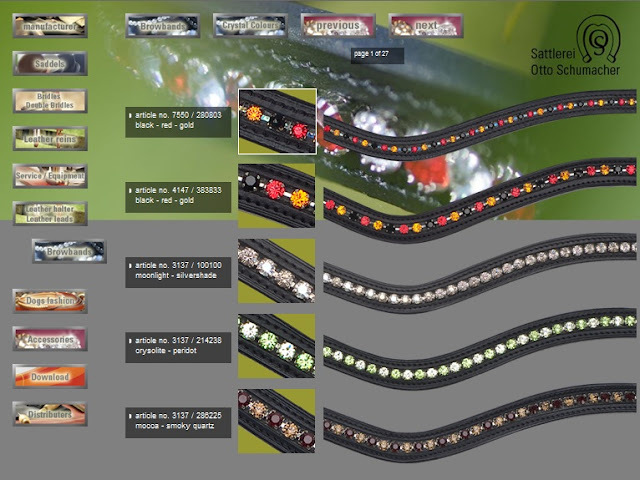 My sister has been looking for just the right bling browband for ages and this totally made her day. TWENTY-SEVEN PAGES! I think I got texts from her for hours as she found new wonderful styles lol.